Continuing with the basket wedding theme here is a basketweave ring. I was really surprised I didn't find more rings with a woven pattern. 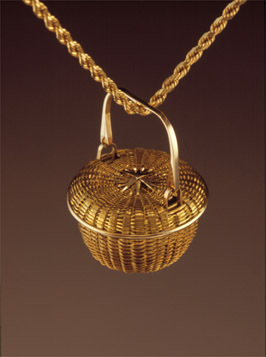 There are so many pendants with baskets, many of which are actually woven of metal, not just cast. Hand forged and hand woven in 18k & 22k gold. Last month I wrote about cakes that looked like a basket. I just ran across this basket, by Mohawk weaver Mary Adams, that looks like a cake. I think if I were going to spend thousands of dollars on a wedding cake I would much rather have one like this! What do you say? Just found another knotting workshop being taught by Norman Sherfield of Eureka, California. The workshop is being held at Gualala Arts Center, located at 46501 Gualala Road in Gualala, CA. I wanna take another class! I haven't gotten to take a class in a while and I am itching to do one. While I still learn something new in any class that I take, the real benefit for me is getting away from the phone, the internet, the laundry and all the other distractions of modern life. I ran across these videos today and oh how do I want to make a new set of Shaker Boxes. John Wilson is the gentleman I took a class from this past winter. It was a great class and so much fun. My nesting set of five boxes are aging nicely. The cherry wood is already getting so dark. You can really notice the change when you take the lids off and see the original color of the wood around the top of the box where the lid has shielded the wood from the light. Right now I have the boxes lined up in a row on the window sill facing the opposite direction to give them a sun tan on their fronts that have been facing into the room. If you are curious on seeing how boxes are made here are a couple of videos that pretty much show you the whole process. This gentleman does a few things a bit differently than Mr. Wilson, but the overall process is the same as the way I learned. 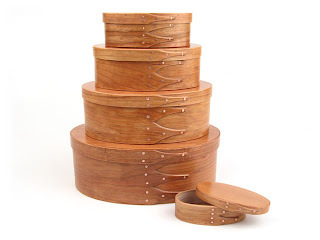 So, if you ever get a chance to take a class, be it a Shaker box workshop or just a make-it-and-take it card class at your local craft shop, do it! Even if you don't learn something new, though I bet you will, at least it will get your mind and your hands working.